Sometimes the weather gets a little bit crazy and the rain pours down from the sky with force. These types of rains don’t happen all the time, but when they do, they can cause major indoor water damage to homes and businesses. Water pounds down on roofs and can cause leaks in the ceilings, it can puddle up outside of the homes and businesses and seep in through windows or cracks, it can even come down so hard that it causes inches of rain to flood the streets, parking lots and driveways and eventually make its way indoors. When heavy rains cause damage to your property, don’t wait to call in professional water damage cleanup crews that can extract the water and dry the water damaged areas quickly to reduce the amount of damage that comes from heavy flooding! 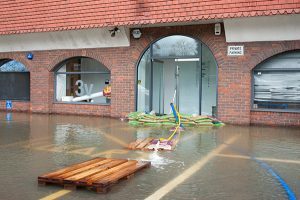 If you live in Conroe, your best water damage cleanup company is Total Restoration. Water damage from rain that floods the inside of a property is not the highest quality of water. Flooding rainwater is often contaminated with dirt and other debris that is unhealthy to be around. If the heavy rain has caused rivers to overflow or sewage to back up and get into your property, then the water is extremely detrimental to your health and should not be touched or stepped in. Contaminated water can easily cause health issues and sometimes even death if not handled properly. Do not risk anyone’s health by getting in the water or asking anyone else to get in the water. Call a professional company that has been trained to properly clean up, decontaminate, and restore areas affected by contaminated water. Even if the source of the water is clean, or seems to be, you do not want to try to clean up the water and handle the restoration process on your own. Professionals have industry sized equipment to extract standing water and dry the affected areas quickly. If water is not completely removed and dried, it can easily turn into a mold problem that will be more extensive and costly to repair. Mold can start growing in as little as 24 hours, so do not waste any time, contact a professional water damage cleanup company like Total Restoration in Conroe. If you have water damage from previous flooding and can see, or suspect, mold growth, don’t worry. Total Restoration in Conroe is a qualified mold remediation company with a team of mold experts that can clean up and repair any area that has been destroyed by mold. Total Restoration is a one-stop-shop when it comes to water damage cleanup, fire damage cleanup, and mold removal. No need to rely on any other company. Do not wait to get help. If you wait too long, you are going to end up with a bigger problem that will take longer to repair and cost more. Do not try to do it on your own. If you do, you are likely to cause a bigger problem. Let the specialists take care of it so that the job can be done the right way, the first time. Total Restoration is local and works around the clock. No matter what time the damage happens, we have a team on call and ready to help!